Santa has been kidnapped by an evil wizard. 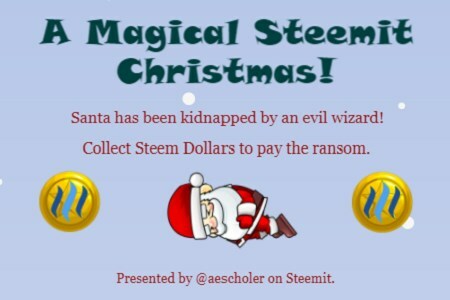 Collect Steem Dollars to pay the ransom in this short but fun, festive quest game.You can find Steem coins in presents, Christmas crackers, and by talking to magical beings including elves, ogres, and warrior women. But be careful! Some gifts are naughty, and some are nice. Coins can either add to your pot, or take away from it. Once you've collected 20,000 Steem Dollars, you'll be transported to save Santa in the evil wizard's castle!If the game seems impossible, it's not. Sometimes, the strategy to winning is hidden away.I created A Magical Steemit Christmas game using the free version of Construct, therefore I had limits to the number of events I could add. Mostly, it was created as a learning project that hopefully others will enjoy. A Magical Steemit Christmas Arrow Keys[/k}Use the arrow keys to move up, down, left, or right. 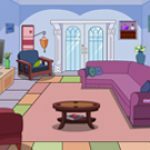 Arrow Keys[/k}Use the arrow keys to move up, down, left, or right.